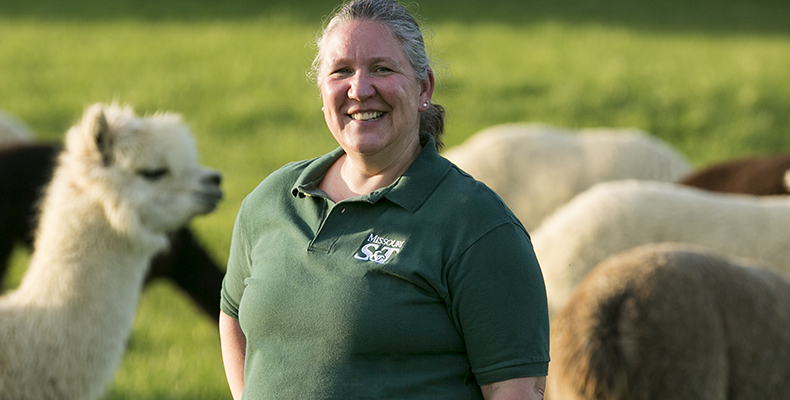 Electrical engineering professor Mariesa Crow likes to unwind with her 17 alpacas. Photos by Sam O’Keefe. Mariesa Crow is about to take a long summer road trip with Elvis and James Bond. No, these aren’t the musical and movie selections Crow will take with her on the winding asphalt path to Montana. They are the names of two of the 17 guys along with her on the trip. But Elvis and James Bond are not superstars, they’re alpacas. As in the long-necked hairy critters that look like overgrown Chia pets with legs. Crow buys them as yearlings with birth names such as Goliath Black. “Many of the alpacas have these really long names, and I just shorten them,” Crow says. 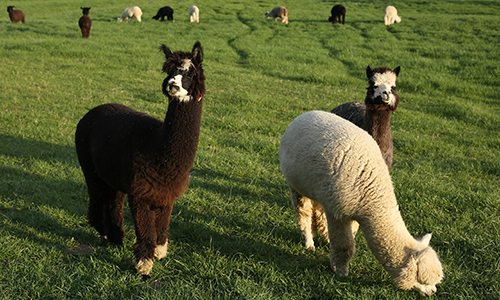 When Crow isn’t writing books on electric power systems, teaching students or conducting energy-related research at Missouri S&T, the Fred Finley Distinguished Professor of Electrical Engineering raises alpacas on an 8-acre grassy hill behind her home along Lions Club Drive in Rolla. Her 17 long-necked males are Crow’s entertainment after a busy day on campus. Crow and her husband, James Drewniak, Curators’ Professor of electrical and computer engineering at S&T, bought the land and pondered raising cattle or horses before a friend suggested alpacas. Crow started with two alpacas five years ago and has typically added a couple of younger males each year to the herd. While playing mother to the 17 boys, Crow points out that the alpacas’ curiosity can make for comical moments at feeding time. She relates the story of one alpaca that thought her new outfit was a new meal. “I wore an orange scarf when I was out here, and of course they are very addicted to carrots,” Crow recalls while evoking the image of a giant triangle of cloth. “So he came up and was sniffing around my neck thinking I had this huge carrot around my neck,” Crow says as she re-enacts the scene with her hands clasped around her neck. In January, the alpacas’ long coats keep them warm in the winter chill, but a warm day in May signals it’s time to harvest the fiber for which the alpacas are raised: their four inches of hair. Joining Crow at this year’s shearing was Missouri S&T senior research specialist Clarissa Wisner. When Wisner isn’t running an electron microscope in S&T’s Materials Research Center, she also raises eight alpacas in her yard just east of Rolla. Wisner came to Crow for information on how to care for her alpacas. Together, the two brought in a professional shearer in early May to shear their herds at Crow’s hobby farm. Electric clippers shave the shearing time down to about 30 minutes for each alpaca. The hair around the belly is methodically wrapped in a plastic bag and sent off to be spun into yarn. Wisner and Crow then scoop up the clumps of neck and leg hair into a trash can for other uses. Crow says her husband would like to use the leftover alpaca hair to insulate the couple’s new barn. Once the yarn returns after processing, Crow then picks up knitting needles to craft sweaters or other garments. A young alpaca’s fiber is soft like cashmere, while an older alpaca’s stiffer fiber is relegated to outer garments. “We have a couple of alpacas we call ‘rugs’ because that is pretty much what you use them for,” Crow says. Crow’s summer road trip is actually the start of a year-long sabbatical for her and her husband. While away writing a textbook revision and technical manuscripts, she will take all 17 of her alpacas with her and board them on 230 acres at Great Northern Ranch in northwestern Montana. 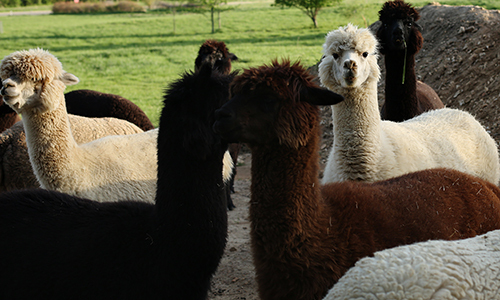 Crow and the alpacas will return to Rolla in time for Crow to resume teaching in the fall 2015 semester. I really enjoyed this interview. Living on a farm and raising cattle it is therapeutic to watch and interact with them. We had a stray sheep show up at our house three years ago and she had two babies and we still have them all of course. I love your Alpaca’s. I would love to photograph them sometime. 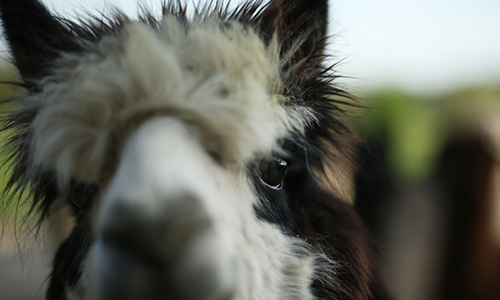 Mareisa – we so enjoy your alpacas. My kids love driving down Lions Club Road to see them. We sometimes walk the acorn trail and stop and say hello to them. We will miss them during your sabbatical! Enjoy your time away! Wish Marissa and Jim a relaxing wonderful time with their boys (alpacas) up in the Montana hills.